The American Revolution brought an abrupt end to the British practice of transporting convicts to America. Back in England, the supposedly temporary solution of housing convicts on prison hulks in the River Thames to relieve prison overcrowding only had a short-term effect, because it wasn’t long before the hulks were completely filled with prisoners as well. Once the British lost the war in America, they also lost any hope of once again using the American colonies as a means of emptying its jails and prisons. The temporary prison hulks, and their dreadful living conditions, began to look like they were going to become permanent. The British criminal justice system had clearly become addicted to convict transportation. The government had come to rely on the low-cost expedient of transporting its unwanted convicts to America. In fact, near the tail-end of the practice, convict transportation didn’t cost the government a dime, since the sale of convicts in America was so profitable that merchants were lining up to transport them for free. Years went by as Parliament resisted expensive solutions, such as building newer and bigger penitentiaries, and tested failed alternatives, including settling convicts in West Africa and increasing the use of the death penalty. In the summer of 1783, the British government decided to push the issue of convict transportation with America, since no treaty or law specifically banned the practice. It hired George Moore, a London merchant, to transport 143 prisoners to America by offering him ₤500 and whatever profits he could receive from selling the convicts. To help him out, Moore established contact with a prominent merchant in Maryland, George Salmon, who believed that the two could make a fortune selling convicts once again in America. Salmon was confident that with no law prohibiting the import of convicts to America and with his significant political connections, he could overcome any potential legal obstacles to the scheme. Even so, George Moore and George Salmon decided to disguise their human cargo as indentured servants and list the ship that was to transport them–which was fittingly called the George–as headed to Nova Scotia. That way, once the ship landed in Maryland, it could claim that it did so in distress, even if the true identity of its cargo were discovered. They even renamed the ship to the Swift to help further obscure its true purpose. The new name of the ship, it turns out, was not nearly as fitting as its original one. Soon after the Swift departed, the convicts rebelled, took over the ship, and ran it aground on the Sussex coast. About one quarter of the convicts managed to escape, although some of them were caught and consequently executed. After spending a month in Portsmouth, the Swift started out once again for Maryland, this time with only 104 convicts. The Swift finally arrived in Baltimore on Christmas Eve, and as planned the captain informed the authorities that the ship had run out of provisions and was forced to cut short its voyage to Nova Scotia. What they hadn’t planned is that news of the hoax had reached Maryland before their arrival. Members of the state assembly in Annapolis were outraged when they first learned of the plan, but when they officially received word on Christmas day that the ship had indeed landed, they were already on recess for the holiday and could not take up any legislation to block the ship’s entry. The sale of the convicts went ahead as planned, although demand was low. Only 30 of the convicts on board were sold by mid-January, and several of the convicts who were purchased had already run away from their masters. Moore and Salmon managed to sell most of the convicts by the spring, but they incurred serious losses after having to provide food, clothing, and medicine for the convicts who languished on board the ship until they were sold. Furthermore, the convicts sold for low prices and the planters whose convicts ran away refused to honor their debts to the two sellers. Despite these troubles, Moore attempted another voyage with 179 convicts in April 1784. Once again, the convicts rebelled. The ship finally made it across the Atlantic after a long trip, but unlike the first time, no American port would allow it to enter. The convicts were finally unloaded in British Honduras, which was none too happy to receive them. Hugh Williamson, a Congressional representative from North Carolina, said of the attempts to transport convicts to America, “Perhaps a greater insult to any Nation could hardly have been offered.” To erase any legal ambiguity about shipping convicts to American soil, Congress passed a law in 1788 that specifically prohibited the import of convicts from Europe. The era of convict transportation to America had officially come to an end. After the botched attempts to reestablish the practice of transporting convicts to America, Great Britain was now on its own in finding an alternative. Back in 1779, Sir Joseph Banks, a naturalist who had accompanied Captain James Cook on an expedition through the South Pacific, had recommended New South Wales as a suitable destination for convicts. However, the estimated cost of ₤30 per head to ship convicts there, six times what it had cost the government to transport convicts to America, quickly put the proposal to rest. Now in a desperate spot, the British government was forced to reconsider its decision. In August 1786, it approved sending convicts half-way around the world to New South Wales. The first fleet of 11 ships carrying 548 male and 188 female convicts set sail from England to Australia on May 3, 1787. These convicts faced very different experiences from their American cousins when they landed and were put to work in a penal colony in Botany Bay. Convicts sent to America were never placed in a penal colony and instead were generally sold off to private plantation owners. Convicts sent to Australia, on the other hand, were under much tighter control. They fell under the direct supervision of the government and were subject to convict discipline, including the use of chain gangs, convict barracks, slop clothing, and forced labor. They could not buy their freedom, as convicts shipped to America could. Convict servants in America were essentially treated like indentured servants, so they could basically blend in with the general population. In Australia, convicts and indentured servants were distinct. Many believed that transportation to Australia would mean the end of the prison hulks in the Thames, but it wasn’t to be. The hulks remained for another 70 years, and convicts sentenced to transportation to Australia were first housed in the hulks to await their passage. If the hulks were too crowded, then the prisoners were sent to Newgate or other surrounding prisons. Over 165,000 convicts were sent to Australia, more than triple the number sent to colonial America, before the practice was officially abolished in 1850. The first four years of transporting convicts to New South Wales cost the British government a staggering ₤574,592. If Parliament had known the cost to establish a penal colony in Australia would be so high, it probably would never have approved the plan. Campbell, Charles. The Intolerable Hulks: British Shipboard Confinement 1776-1857 . Bowie, MD: Heritage Books, 1994. Colquhoun, Patrick. A Treatise on the Police of the Metropolis; Containing a Detail of the Various Crimes and Misdemeanors … And Suggesting Remedies for Their Prevention. 5 ed. London: Printed by H. Fry, for C. Dilly, 1797. Database: Eighteenth Century Collections Online: Gale. Ekirch, A. Roger. 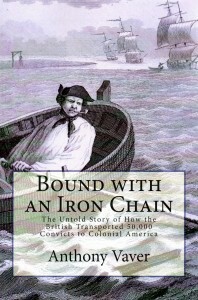 “Great Britain’s Secret Convict Trade to America, 1783-1784.” The American Historical Review 89.5 (1984): 1285-91. Hughes, Robert. The Fatal Shore: The Epic of Australia’s Founding . New York: Vintage, 1986. Keneally, Thomas. A Commonwealth of Thieves: The Improbable Birth of Australia . New York: Nan A. Talese, 2006. Kercher, Bruce. “Perish or Prosper: The Law and Convict Transportation in the British Empire, 1700-1850.” Law and History Review 21.3 (2003): 527-84. Williamson, Hugh. “Hugh Williamson to Samuel Johnston [October 17, 1788].” Letters of Delegates to Congress. Vol. 25: March 1, 1788-December 31, 1789, p. 433. Database: American Memory: Library of Congress. This was written by Anthony Vaver. Posted on Wednesday, September 23, 2009, at 10:27 am. Filed under 6. The End of Transportation. Tagged Convict Transportation, Criminal Justice System - England, Maryland, Nova Scotia. Bookmark the permalink. Follow comments here with the RSS feed. Post a comment or leave a trackback. For some reason, I’m very amused at the thought of British bureaucrats and businessmen trying to maintain the convict transportation system as if the Revolutionary War had never happened. Convicts were sent to America in the 1600’s until 1775 – a much longer period of time than that of convicts being sent to Australia. The number of convicts landing in America was much greater than that of those sent to Australia – please correct this misinformation on your website. Convicts were sent to America from 1614 – 1775 (161 years). Convicts were sent to Australia for only 81 years (1787 – 1868). There is no way that there were triple the number of convicts sent to Australia than America. America by far had the bulk of the convicts and the worst convicts. Australia got the tail end of this not the bulk. Just because England sent convicts to colonial America for a longer period of time than to Australia does not necessarily mean that it transported more convicts during that time. If we add the number of convicts sent to America during the 1600’s to those sent in the 1700’s, we get a total of 54,500 convicts (2,300 from 1607 to 1699, and 5,200 from 1700 to 1775; Source: Aaron S. Fogleman, “From Slaves, Convicts, and Servants to Free Passengers: The Transformation of Immigration in the Era of the American Revolution,” The Journal of American History 85.1 [Jun., 1998]: 43-76. ), far below the 165,000 sent to Australia.